As a recent diver in training, hopefully your interactions with your instructor have led you to trust and admire him or her as an educator, a mentor, a diver and an individual. The vast majority of recreational scuba instructors are knowledgeable, enthusiastic, personable, empathetic and professional and he or she has hopefully inspired you to become passionate about diving. Maybe you could even see yourself following in your instructor’s footsteps and becoming a professional scuba instructor yourself. So naturally you start wondering what professional education and teaching credentials your instructor has and whether all instructors have the same qualifications. What is it really like to work as a scuba instructor? And what does it take to become one? What Defines a Scuba Professional? Scuba instructor is actually only one of many professions involving scuba diving, albeit the most visible within the recreational diving community. The general category of recreational dive industry professional encompasses all those who receive compensation for their work and, in North America at least, are required to carry professional liability insurance. This category includes several professional levels with limited certifying authority, such as divemasters and assistant instructors, as well as several career levels beyond Open Water Instructor. A composite of certifying agency statistics places the average age of scuba instructors in the United States at 38 years. Currently, 20 percent of instructors are female, but that statistic will surely increase, as the number of new divers who percent. It’s not just demographics that define scuba professionals, however; it’s their commitment, their character and their passion for sharing the sport. Dive pros who work in tropical resort locations often work long hours for relatively modest pay. Many say that they do it “for the love of diving” and the lifestyle more than the paycheck. What Does the Instructor Job Entail? Obviously, scuba instructors are educators. Whether via traditional classroom instruction or in the e-learning format with knowledge reviews and personal augmentation, your instructor guides you through the academic portion of scuba certification courses. He makes sure you understand and appreciate the most important safety rules before it is time to apply them in the water. To accomplish this, the instructor must achieve and maintain up-to-date knowledge in diverse subjects such as physics, aquatic sciences, physiology, oceanography, weather, boating, equipment mechanics and fitness. Instructors are responsible for confined-water instruction and open-water training and evaluation. 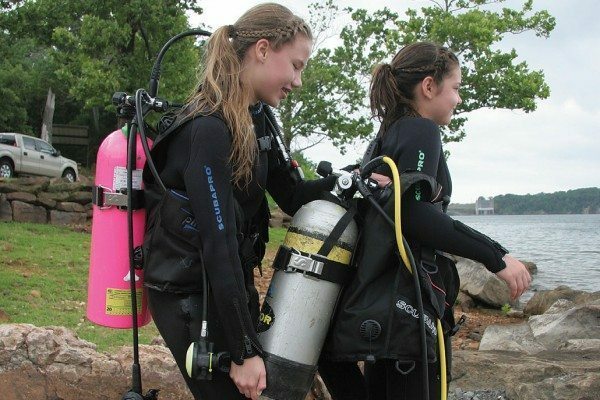 Their goal is to develop safe, confident, independent divers. They must be able to demonstrate every water skill in a manner that students can easily comprehend and imitate and be willing to work with students until they master each one. It also means spending extra time and effort helping those who are slower to learn than others. Teaching scuba also requires awareness of and attention to human dynamics. To succeed at their goal, instructors must empathetically deal with several factors, such as students’ fears (real and imagined), interpersonal relationships between family members, physical stumbling blocks and conflicting schedules. They sometimes act as counselor, mentor and surrogate parent, as well as teacher. The best instructors don’t just train students on safety rules and equipment usage, they prepare them to think for themselves and act appropriately in unexpected situations. They bear a significant legal and moral responsibility to certify competent scuba divers. To student divers at all levels, instructors are role models — perhaps the first and only representatives of the scuba community that a novice diver gets to know. Whatever dive-related habits their instructors exhibit, students are prone to imitating. “Do as I say, not as I do,” doesn’t work when it comes to scuba instruction. The jobs that scuba instructors are required to perform often go beyond teaching scuba courses. Although part-time instructors may be responsible only for teaching classes, this typically involves significant preparation. In addition to reviewing online quizzes or preparing lesson plans, they may need to schedule classroom and pool locations, pick up and transport equipment to and from the training and dive venues, and assign and brief certified assistants. Full-time instructors are typically expected to wear many hats. When not teaching a class, instructors may be assigned to work in the retail end of the business, greeting customers and selling equipment, courses and dive trips. Tank filling and rinsing of returned rental equipment are common duties as well. For those with proper training, visual cylinder inspection, gas blending and equipment repair are on the schedule. Staff instructors at dive centers that operate charter boat trips get to work on the boat. With a captain’s license or in countries where one is not required, an instructor may operate the boat. Otherwise, in addition to supervising students or guiding certified divers underwater, they serve as crew, handling the anchor and assisting with docking and other chores. Scuba tanks need to be loaded before the charter and hauled back to the fill station afterward. The boat must be cleaned, fueled and secured. In many locations the scuba instructor participates in all of these tasks. Outside of working hours, scuba instructors also have a responsibility to remain physically fit for diving and to continually update their knowledge base with innovations in equipment technology and advances in teaching methods. Instructors may also continue their professional education to qualify to teach specialty and technical diving courses, and eventually to teach and evaluate instructor candidates. To quote author Simon Sinek, “Working hard for something we don’t care about is called stress; working hard for something we love is called passion.” It’s passion for the underwater world that motivates many divers to become instructors. Take Rob Knolle, for instance. “When I was just 5 my dad threw me off the dock into the lake to make me swim. From then on I loved the water and became an avid freediver. Life got in the way for a few years, and then a friend of mine who is a dive instructor encouraged me to get certified. Five years later I made it to instructor,” Knolle says. In 2008 Knolle quit his day job; now he teaches scuba and manages a Michigan dive center. Todd Bingham loves watching students succeed and being told it was because of him, but the lifestyle is also an incentive. “You get to wear shorts and sandals to work instead of a suit and tie,” he says. Although not noted for high pay, there are financial benefits as well. 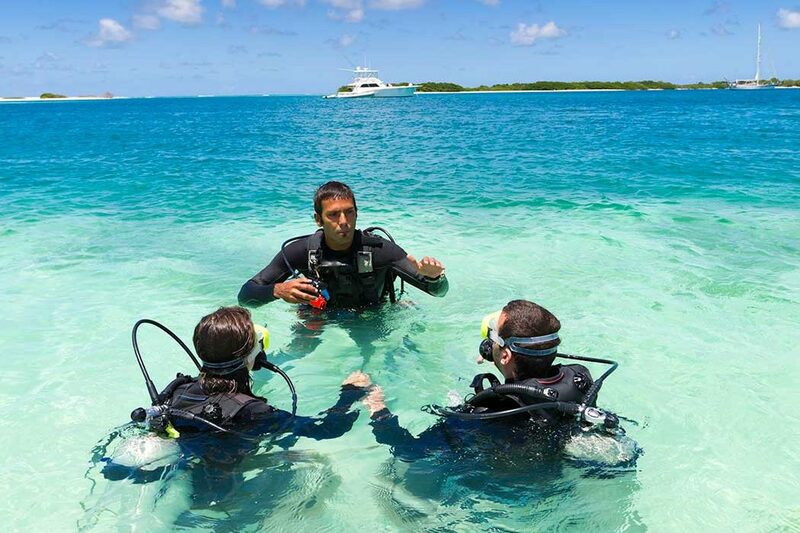 In many areas part-time instructors can earn enough to pay for their personal equipment and dive travel. Full-time instructors employed at dive centers are encouraged to try out new equipment models so they are better prepared to advise their students and store customers on gear purchases. And they often are entitled to purchase equipment at discounted rates. Benefits also include free or heavily discounted dive travel. Dive center staff instructors often get to lead group dive trips to exotic destinations. During the trip they may conduct specialty courses and complete open-water training dives with students who expect to dive primarily in tropical settings. For some, their dream job is to be a scuba instructor at a tropical resort destination. My husband and I quit our corporate jobs to teach scuba, first on a live-aboard dive boat, then in the Cayman Islands and Hawaii. For us the physically demanding 12-hour days, six days a week were more than worth it. I especially enjoyed conducting introductory scuba experiences with vacationers. I knew that even if they didn’t ever get certified to dive, that one wonderful time underwater had opened their hearts to a new world and changed their lives for the better. The life of a resort scuba instructor is attainable for those who prefer an outdoor lifestyle, maintain a flexible attitude and can handle living many miles away from family. It’s a great way to experience other cultures and meet people from all over the globe. But it is not an ego trip — or it shouldn’t be. Nor is it all sunny skies, plentiful diving and cocktails at sunset. That doesn’t mean it’s not a fulfilling way to impart your passion for scuba to others while earning part-time or fulltime income and enhancing your own diving experience at the same time. Any diver who is potentially interested in pursuing scuba as a profession should complete an overview (i.e., advanced) course, first aid and diver rescue, and as many specialty courses as possible. Some are prerequisites for leadership-level certification courses, plus, the broader your knowledge and the better your skills the more attractive you’ll be to a prospective employer. Specialties pertaining to your local diving environment (e.g., ice diving, river diving, environmental awareness) and equipment-related specialties are particularly helpful. Before completing courses leading to certification as a scuba instructor, you should gain proficiency diving in a variety of situations and conditions. To be an effective leader, teacher and role model, you’ll need to personally experience and master the challenges inherent in diverse types of diving (e.g., drift, deep, night, muck diving). In addition to instilling personal confidence, broad experience will help you empathize with the fears and uncertainties of inexperienced students. Once you’re comfortable with your diving skills, have a number of specialties under your belt and have dived in a variety of underwater situations, the next step toward becoming a scuba instructor is to graduate to the first level of professional leadership. Although duties and responsibilities vary among training agencies, the initial leadership course is either divemaster, assistant instructor or equivalent. Divemaster training is geared toward preparing the individual to plan and guide certified divers on open-water excursions. It may include boat handling, assessing and treating diving injuries and assisting divers with equipment and skill problems. 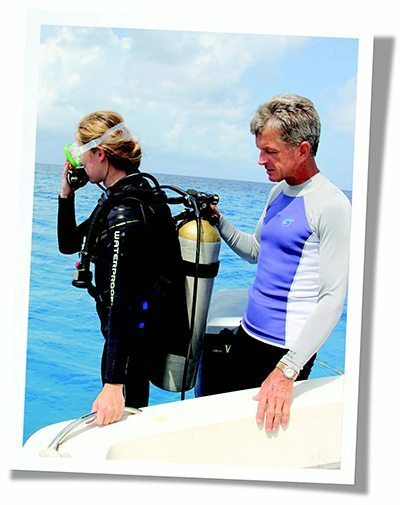 Divemasters may also be authorized to assist instructors by guiding students on underwater tours and teaching certain training activities (e.g., snorkeling techniques) under the direct or indirect supervision of an instructor from that agency. General prerequisites for divemaster include a minimum age of 18, 20-40 logged dives, diver rescue certification, current CPR and first-aid training and medical clearance. In some cases a number of specialty certifications are also required as proof of breadth of diving experience. (Divemaster should not be confused with Master Diver, which is a nonleadership rating recognizing specialty certifications and number of dives.) Divemaster training involves extensive academic knowledge development as well as in-water training. Prior to certification as a divemaster, the candidate must have completed and logged at least 60 dives in a variety of diving conditions and pass all exams and watermanship tests. The NAUI or PADI Assistant Instructor or SSI Dive Control Specialist course is more designed to emphasize teaching skills. Candidates develop instructor-level knowledge and demonstration of quality water skills. Primary responsibilities include acting as a certified in-water assistant to the instructor, plus he or she may be authorized to present certain academic modules, both under instructor supervision. They may also be authorized to teach lower-level courses such as their agency’s skin diving course and first-time scuba introduction courses in a pool. Depending on the training agency, prerequisites for AI training vary from 20 logged dives to divemaster or equivalent certification. Minimum age is 18 and medical clearance, diver rescue and current CPR/first-aid training are required. Sixty to 75 diverse dives are required prior to certification, plus passing watermanship and skill proficiency tests. Although divemasters, assistant instructors and other pre-instructor ratings are considered scuba professionals and must carry liability insurance, their authority to teach and evaluate students is limited. Only scuba instructors are qualified to evaluate and certify students from Open Water through the lower leadership levels, using the procedures and teaching methods specified by their certifying agency. Each scuba training agency trains and certifies its own professionals by offering a unique curriculum that reflects the learning philosophy of that agency. Prerequisites to enroll in instructor training or development courses include divemaster or assistant instructor or equivalent certification, a minimum age of 18 or 21 years and 50-75 logged dives in varied environments, depths and activities. The number of dives required prior to certification as a scuba instructor may be as high as 100. Some agencies offer special courses to prepare candidates for the rigors of instructor training. Instructor courses are not necessarily offered by every dive center. The development portion is conducted by a higher-level instructor certified to teach instructors in conjunction with an authorized dive center or dedicated instructor training facility. An external evaluator from the certification agency staff then conducts the final evaluation to determine whether a candidate is qualified for certification as an instructor. Training may be completed in several very intensive weeks or through an internship of a year or more. In most cases accepted candidates can complete the extensive academic requirements online, including augmentation by an instructor trainer or course director. Candidates develop their teaching skills by making practice presentations on academic subjects as well as demonstrating the proper way to perform water skills to actual students or role-playing instructor candidates. Instructor evaluations judge not only the depth of academic knowledge and quality of skill performance, but also a candidate’s ability to teach effectively, motivate students and solve problems. As an added benefit, some instructor training programs include additional course work to prepare students for jobs in the business of diving. Subjects include retail sales, dive center management, resort operations, marketing and gas blending. Worldwide placement services are even offered by schools dedicated to teaching recreational scuba professionals. College credit may also be available for successful completion of a scuba instructor course. Once certified as an Open Water Instructor, the education process is not over. CPR and first-aid certifications must be updated regularly. Most training organizations require, or highly recommend, that their instructors continue their education through advanced courses, seminars or other in-service learning experiences and certify a certain number and variety of students annually to maintain active status. Instructors who wish to teach specialty courses must show proof of certification and at least a minimum number of dives in that type of diving, plus pass a qualifying test. Further training and certification is also required to teach technical recreational (tech-rec) pursuits such as extended range, cave and mixed-gas diving. Certification to teach recreational dive students is not the end of the continuing-education road. Active scuba instructors may achieve additional titles, such a SSI’s Master Instructor and PADI’s Master Scuba Diver Trainer, by certifying a specified number of students at various levels and completing a minimum number of dives. However, to conduct instructor training and evaluate candidates, additional training and experience are necessary, plus the candidate must agree to adhere to the teaching philosophy and exclusive use of the chosen agency’s instructional system and materials. The exact path to qualify to train instructor candidates varies by certification agency, but generally prospective instructor trainers/course directors must first achieve an advanced recognition level as an instructor and complete an additional training course, after which they are required to participate as staff during one or more instructor development/training courses. They must also be free of ethics or standards violations and maintain fitness standards. Once qualified, they conduct instructor training and development courses. Still higher ratings determined by agency headquarters staff are required for those who evaluate instructor candidates for qualification to teach various levels and specialties. Is Teaching Scuba for Me? Before you decide to become a scuba instructor, consider whether your motivation includes a desire to share your passion for scuba with others, and you have the interpersonal skills to work with a variety of personalities and the stamina to handle the physical demands. Do sufficient research to ensure that your expectations are realistic. Then match this with your personal goals and financial considerations. As noted earlier, the life of a scuba instructor is not just dive, dive, dive. Much of the time underwater you are not free to do as you please, but are responsible for the training of students who depend on you for their safety. It is a serious moral and legal obligation to be responsible for someone else’s life, a responsibility that must be taken seriously at all times. It is estimated that only about 30 percent of scuba instructors are employed full time, with part-time instructors typically working in local dive centers. It’s a win-win situation: The dive center is able to control costs depending on teaching volume and the instructor makes extra money and gets perks in travel and equipment, plus sharing his love of diving. If you do decide to go the professional route, the first step is to master the skills and knowledge required by advancing through the curriculum of courses, plus as many additional skill sets as you can. Sources to find employment include your local dive center, referrals through training agencies, dive shows and personal contacts in the industry. Even if you decide that teaching scuba is not your thing, numerous opportunities exist for employment in fields that involve diving. Certification as a scuba instructor, if not required, is a foot in the door for many of these professions. There are many benefits to being an active scuba instructor. In addition to the satisfaction of opening the minds and hearts of students to a new world, you’re surrounded by congenial people who share your enthusiasm for the scuba lifestyle. Although you’re unlikely to get rich teaching scuba, you will qualify for discounted or free equipment and trips. You have the potential to lead groups to exotic tropical destinations or live in one. The life of a scuba professional is not for everyone, but for those who embrace its rewards as well as its sacrifices, it’s the perfect antidote to stress.